I was reading an article today about the mathematician John Nash, whose life the movie “A Beautiful Mind” was based on. The article contained a link to a clipping from the movie that, it said, explained the game theoretic concept of a Nash equilibrium. In the clip, Nash and his three friends are at a bar and have to make a choice. They can go and speak to the four brunettes at the bar, or they can all go to talk to the lone blonde, whom they all like better. Nash explains to his friends that if they all went to speak to the blonde, she would be put off by all the attention and turn them all down. But once the blonde turned them down, the brunettes would too, since no one wants to be someone’s second choice (and so they would all lose). So, Nash convinces his friends to ignore the blonde and speak to one of the brunettes each (so that they would all win). The strategy of ignoring the blonde, the movie suggests, results in a Nash equilibrium. However, that turns out to be incorrect. The strategies adopted by the four men do not result in a Nash equilibrium. A Nash equilibrium is only obtained when all players adopt a strategy where no single player, by changing his strategy, can obtain a better outcome. That is obviously not true in this case. Any one of the four friends, by reneging on their deal, might get to go home with the blonde (a better deal). So, the strategy of going after the second choice does not satisfy the conditions for a Nash equilibrium. 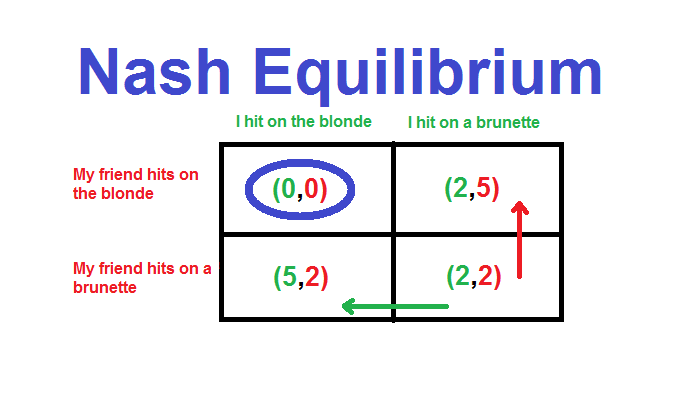 A Nash equilibrium is really only obtained when all the men follow the strategy of going after the blonde (in vain). Professor Nash passed away a few days ago in a car crash.